Bree Newsome commits one of the most iconic acts of defiance, patriotism and civil disobedience in decades. As politicians hem and haw about removing the Confederate flag from the South Carolina capitol building, one activist decided she’d take matters into her own hands – literally. 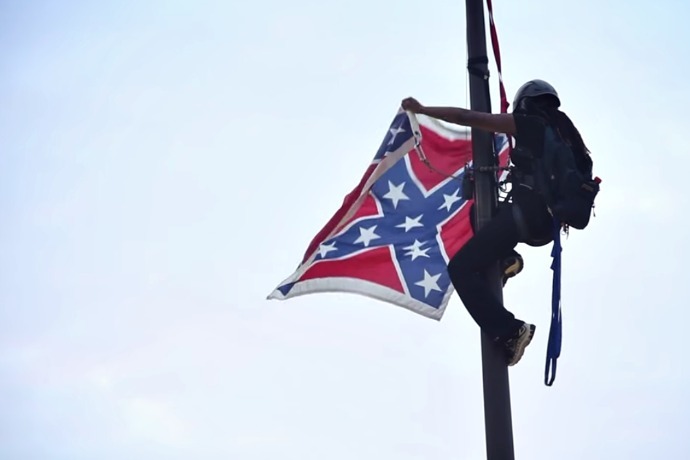 On June 27, Bree Newsome, an activist and artist who’s spent a lifetime opposing injustice, climbed the flagpole, removed the flag and was arrested promptly upon hitting the ground. …I removed the flag not only in defiance of those who enslaved my ancestors in the southern United States, but also in defiance of the oppression that continues against black people globally in 2015, including the ongoing ethnic cleansing in the Dominican Republic. I did it in solidarity with the South African students who toppled a statue of the white supremacist, colonialist Cecil Rhodes. I did it for all the fierce black women on the front lines of the movement and for all the little black girls who are watching us. I did it because I am free. Most mainstream politicians agree that the flag should be taken down, including the majority of presidential candidates and South Carolina Governor Nikki Haley. However, some politicians, even those sympathetic to Newsome, expressed regret at her rashness and encouraged patient respect for the political process. Their hearts may be in the right place, but theirs is the typical narrative of people in power: pretend to understand the grievances of the suffering, reassure them the right thing will be done in due course, and chastise those who take action. Bree Newsome smiles for a job well done during her arrest. Notice the black officer balling up the flag in his hands, as if unconsciously regretting he had to make the arrest at all. The disenfranchised in America have done enough waiting. Black Americans are used practically as target practice for the nation’s police forces while the political process is so choked up that it can’t even remove a mere symbol; who knows how long real solutions on real issues will take. Politicians should just pin a medal on Newsome for taking care of this issue cleanly and quickly and leave the flag where she put it. In a political sense, the only thing the Confederate flag stands for is racism. It stands for racism because, in the political realm, it was the banner of the pro-slavery side. And South Carolina’s flag in particular stands as a monument to racism. Nearly 100 years after being lowered, when the Confederacy lost the Civil War, it flew again in 1961 specifically to make a bold statement against the boiling Civil Rights movement. Since then, the flag has flown above or at the capitol grounds in Columbia, not without controversy but with very few taking the controversy seriously. In the wake of the June 17 massacre of nine black Christians by a white supremacist at a Charleston church, renewed focus made the flag essentially a scapegoat. This isn’t to declare the flag’s innocence – nothing about the definition of a scapegoat means it has to be innocent, and the flag is more than deserving of the treatment – but the nation is casting the sins of slavery, racism, hatred and intolerance on the flag and then calling for its removal. For this reason, it’s hard not to see the issue as largely a distraction. Politicians can feel comfortable taking a stand on it without addressing the flesh-and-blood issues of systemic racism and firearm proliferation. But even symbolic victories are important in movements. Newsome committed one of the most iconic acts of defiance, patriotism and civil disobedience in decades. Denying any politician the privilege, she tore down a symbol of hatred, divisiveness, bigotry, slavery and treason. If Americans can’t stand with her in opposition to these characteristics, it will start to look as though the nation has made no progress in the last 150 years at all. Bree Newsome turned the spotlight away from the political hemming and hawing and back on the people affected by the dark legacy of the Confederate flag. That was only the first step. 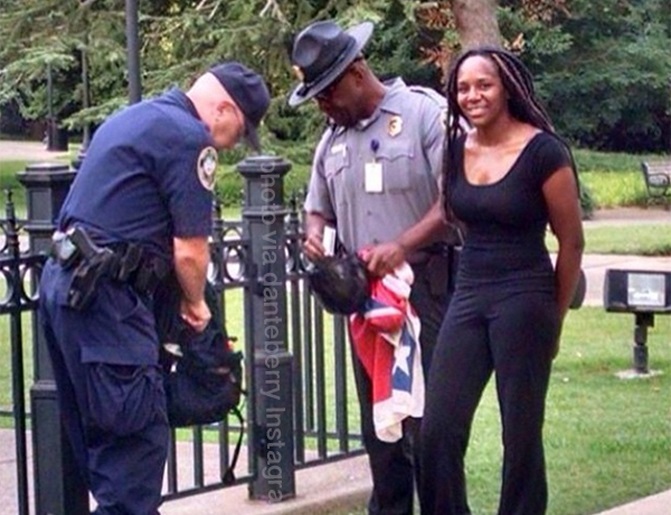 Photographs of her untying the flag and being arrested afterward will one day find their place in history books. Her actions can and will inspire a whole nation full of disenfranchised minorities, women and activists not to wait on change from above but to fight for it today – with courage, nonviolence, and their own bare hands. Its inanities and glib pretensions are so thick that it mainly comes across as tacky and contrived. Heathers, with all its flagrant masochism and violence, is a throwback to a more innocent time, where such films could be made and still be deemed over the top fantasy.